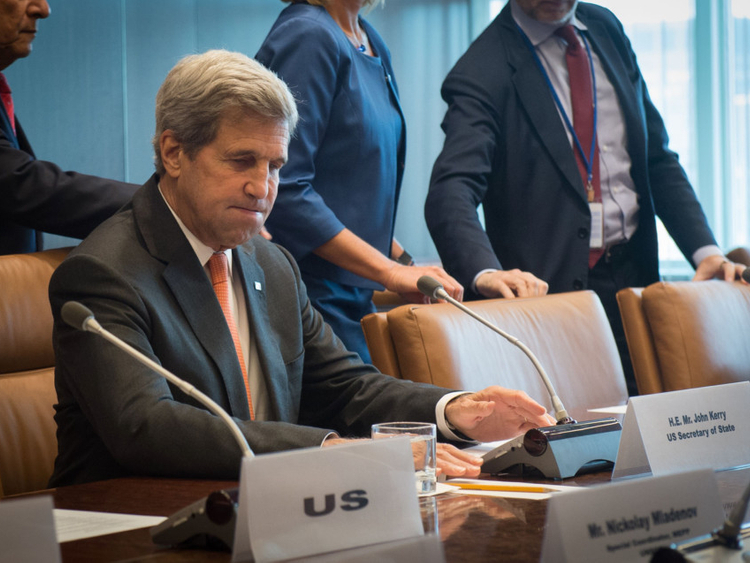 Beirut, Lebanon: Secretary of State John Kerry was clearly exasperated, not least at his own government. Over and over, he complained that his diplomatic efforts on Syria had not been backed by a serious threat of US military force. He bemoaned Russia’s continued bombing of civilians, its seeming disregard of international law, and his inability to stop it. But then Kerry did something that astonished the Syrian civilians at the table: He suggested that they participate in elections with President Bashar Al Assad, five years after President Barack Obama demanded that the Syrian leader at the heart of the war step down. A woman in the group responded bluntly. The meeting, which took place on the sidelines of the UN General Assembly in New York last week, provides a searing glimpse into Kerry’s frustration with the Syrian crisis - and the depths of despair and anger Syrians who oppose their government feel about America’s inability, or unwillingness, to end the war. Kerry’s frustrations and dissent within the Obama administration have hardly been a secret. But in the recorded conversation, Kerry lamented being outmaneuvered by the Russians, expressed disagreement with some of Obama’s policy decisions and said Congress would never agree to use force. In the meeting, Kerry veered between voicing sympathy for the Syrians’ frustration with US policy and trying to justify that policy. But as the recording showed, he has also been unable to sell Syrian opponents of Al Assad, like the ones in that room, on a policy he does not wholeheartedly believe in. The conversation took place days after a brief cease-fire, spearheaded by Kerry, crumbled. His Russian counterpart also rejected outright Kerry’s new proposal to stop the bombing of Aleppo. Those setbacks were followed by days of crippling Russian and Syrian air strikes in Aleppo that the World Health Organisation on Wednesday said had killed 338 people, including more than 100 children. At the meeting last week, Kerry tried to explain that the United States had no legal justification for attacking Al Assad’s government, whereas Russia had been invited in by the government. “The problem is the Russians don’t care about international law, and we do,” he said. The meeting took place at the Dutch Mission to the United Nations on Sept. 22. There were perhaps 20 people around a table: representatives of four Syrian groups that provide education, rescue and medical services in rebel-held areas; diplomats from three or four countries; and Kerry’s chief of staff and special envoy for Syria. The recording was made by a non-Syrian attendee, and several other participants confirmed its authenticity. Several of the Syrian participants said afterward that they had left the meeting demoralised, convinced that no further help would come from the Obama administration. In the meeting, he and the others pressed Kerry politely but relentlessly on what they saw as contradictions in US policy. Their comments crystallised the widespread sense of betrayal even among the Syrians who are most attractive to Washington as potential partners, civilians pushing for pluralistic democracy. Kerry and Obama have expressed angst over Syria, but it was Kerry, in his closed-door meeting, who opened himself up to criticism of US policy from those most affected by it: Syrians opposed to the Al Assad government. Shehwaro demanded “the bottom line,” asking “how many Syrians” had to be killed to prompt serious action. Kerry responded that “Al Assad’s indifference to anything” could push the administration to consider new options, adding, “There’s a different conversation taking place” since the intensified bombing of Aleppo and the further breakdown of talks with Russia. But he also said any further US effort to arm rebels or join the fight could backfire. But Washington will not join the same rebels in fighting Hezbollah, the Lebanese Shiite militia allied with Al Assad, even though the United States lists Hezbollah as a terrorist group like the others. He also spoke of the obstacles he faces back home: a Congress unwilling to authorise the use of force and a public tired of war. “We’ve been fighting in Afghanistan, we’ve been fighting in Iraq, we’ve been fighting in the region for 14 years,” Kerry said. One of the Syrians in the room assured Kerry, “No one is requesting an invasion,” but he insisted that the rebels needed more help. As time ran short, Kerry told the Syrians that their best hope was a political solution to bring the opposition into a transitional government. A State Department official, speaking on the condition of anonymity, said later that Kerry was not indicating a shift in the administration’s view of Al Assad, only reiterating a long-standing belief that he would be ousted in any fair election. Kerry himself described an election set up by Western and regional powers and the United Nations, “under the strictest standards.” He said the millions of Syrians who have fled since the war began in 2011 would be able to participate.